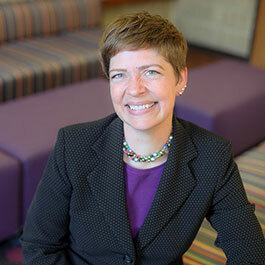 Dr. Kelly A. Schaefer, Assistant Vice President (AVP) for Student Engagement in Student Affairs, has been part of the Northwestern Student Affairs division since January 2012 as the Norris University Center’s Executive Director. As of July 2015 Kelly became the AVP. A long-time student advocate since her undergraduate days as a Resident Advisor and campus-wide program planner, Kelly, with a team of 45 professionals and graduate students, oversees the areas of Campus Inclusion & Community; including Multicultural Student Affairs, Social Justice Education, and Student Enrichment Services; Religious Life; and the Campus Life, which includes Fraternity & Sorority Life, Leadership Development & Community Engagement, and Student Organizations & Activities. In addition to her responsibilities in Student Engagement, Kelly has lead division initiatives, such as coordinating the Diversity and Inclusion Institute, measuring student engagement across the division, and chairing an implementation task force for Listening and Getting to Know Black Students Regularly, Not Just in Times of Crisis. Also, Kelly co-chairs Commencement for Northwestern University. Under her leadership as Executive Director of Norris, Norris transformed into a student-focused, inclusive and engaging environment for all members of the university community. Kelly also carried this approach into the planning of the new University Commons, by engaging students, staff, and community members in the process. In addition to her work at Norris, Kelly advised NU Threads and the Graduate Student Association, two examples of her strong commitment to student development. Prior to Northwestern, Kelly served as the Director of Campus and Conference Centers and co-managed the campus dining program at the Illinois Institute of Technology in Chicago. While at IIT, Kelly exceeded university thresholds for student satisfaction in 92% of her operations and programs. Kelly also advised the Alpha Sigma Alpha Sorority. Previous to her tenure at IIT, Kelly served as the Assistant Director of Student Centers for DePaul University where she partnered with the Office for Student Involvement to integrate Student Center operations and programming. While at DePaul, Kelly advised Spectrum, the gay, lesbian, bisexual, trans*, and queer group on campus. She also presented a webinar to a national audience of 250 professionals about advising and supervising. Her creative approach, new ideas and solutions have garnered her wide-spread support and respect across the University. Additionally, her collaborative and open leadership style is valuable in her role as AVP, as she works with multiple stakeholders and all our students to truly be engaged in their Northwestern experience.